Unleash the Healing Power of Forgiveness As imperfect people living in an imperfect world, we eventually confront in nearly every relationship the need to extend or receive forgiveness. But when the wounds run deep, forgiveness doesn't come easy. This eye-opening study deals with the difficult questions of forgiveness, including How can I forgive when the pain is so great? Does forgiving mean I have to forget the past? and What if I choose not to forgive? As you dig into what the Bible says on this vital topic, you'll encounter the depths of God's own mercy and discover how choosing forgiveness can free you from a painful past and propel you toward being all that God intends you to be. Forgiveness Breaking The Power Of The Pa by BJ Lawson; David Lawson; Kay Arthur was published by Waterbrook Multnomah in July 2009 and is our 25227th best seller. 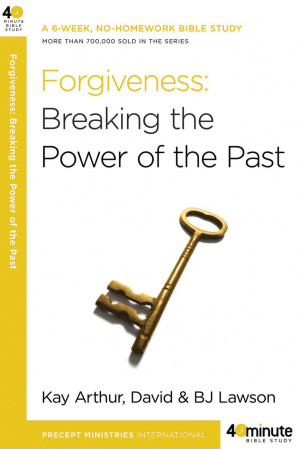 The ISBN for Forgiveness Breaking The Power Of The Pa is 9780307457592. Be the first to review Forgiveness Breaking The Power Of The Pa! Got a question? No problem! Just click here to ask us about Forgiveness Breaking The Power Of The Pa.